Come in, make yourself, at home, and take a look around! Please don't pry in my medicine cabinet, but do take a look at the photos. You can probably tell that food photography is a work in progress for my assistant T, and while I'd love to take the helm, it's a little hard to snap photos when you're imaginary. In any case, imagine how thrilled T was when her friend Vic encouraged her to try out his SLR camera. 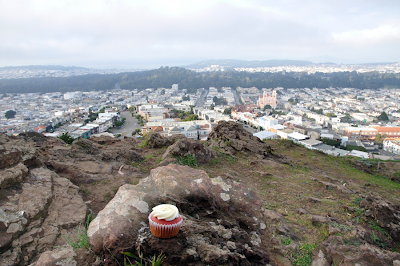 And imagine how thrilled I was to see my lovely red velvet cupcakes gallivanting around beautiful San Francisco in these crystal-clear photos. Thanks, Vic! I still remember hating on red velvet cupcakes, calling them "overrated" and "nothing more than a vehicle for cream cheese frosting" after a series of red velvet disasters that occurred when T first started trying to make them. It's been a year since our first successful batch, and we've continued to improve upon our recipe. Now, I'm finally a fan. 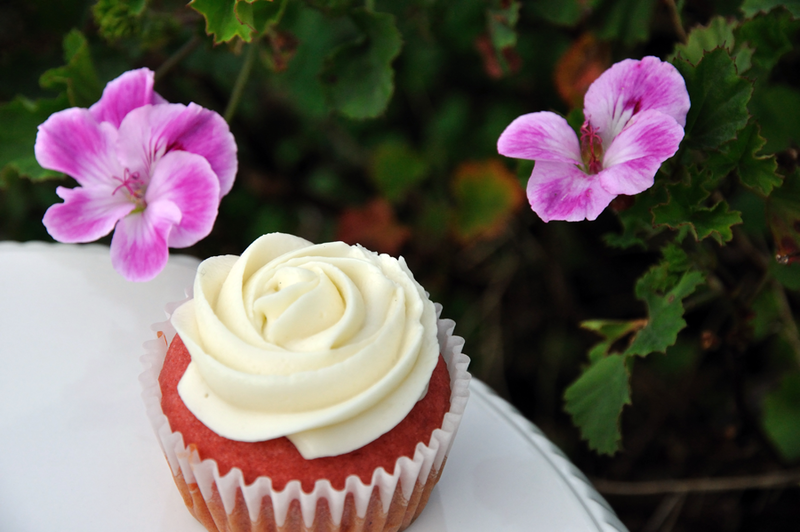 Moist, buttermilk cake with a touch of cocoa, topped with silky vanilla cream cheese frosting -- I can do without the red food coloring, but have to admit that these cupcakes are quite a treat! And here they are, staring off into the sunset in the residential Sunset district near Ocean Beach. 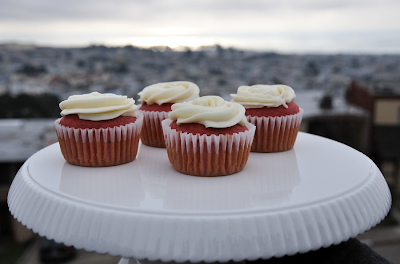 Delicious, beautiful to photograph, and such a rock star in the cupcake world -- it's good to be red velvet.